Smart Allergy Friendly Education: Milk-Free Chocolates from Premium Chocolatiers - and FREE of so much more! Milk-Free Chocolates from Premium Chocolatiers - and FREE of so much more! 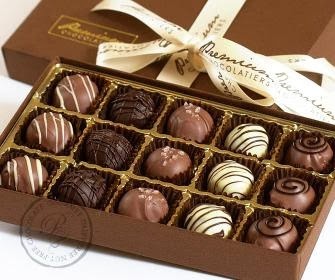 It's that time of year again when I place my specialty order for chocolates - directly from Premium Chocolatiers. They are our family favorite. I think these milk-free, peanut/tree nut free, gluten free, egg free, vegan chocolates are the best around. Besides the TRUFFLES, I also ordered some CANDIED MARSHMALLOWS, one SAFE SANTA and got a second one FREE with my order. The truffles arrived today and they are rationed for days! Our overall favorite is the Salted Caramel. Surprisingly this year, my son really enjoyed the Coffee and my daughter enjoyed the Grand Marnier. I think she liked the white chocolate option. If you enjoy dark chocolate, the Raspberry may be your favorite, and the simpler flavoring of the Milk Fudge will be a hit for anyone! My husband will eat any of them, as witnessed by my daughter when she saw her dad eating HER SPECIAL CHOCOLATES - 3 of them to be exact! MAN! Did he get an earfull when she reminded him that he CAN eat ANY chocolate he wants, whereas she CAN'T. Good news for Premium Chocolatiers... I will be placing another quick order for the holidays! Sure, I could make my own, and I do. With all of the things they can't have because of their food allergies, this is my holiday splurge for them. Thanks Premium Chocolatiers for helping to create such wonderful memories and traditions in our home during the holidays!